Treat yourself to a perfectly well-rounded boot for most jobs. This 8" Carolina Men's CA9821 waterproof logger has attractive Crazyhorse leather with a distressed look. With a 100% SCUBALINER™ waterproof membrane and steel safety toe, these boots will keep your feet dry and comfortable all day long. Heavy duty Carolina steel shanks add superior arch support for improved stability and control. And speaking of control, this oil and slip resistant one piece rubber outsole will keep you safe and upright through some of the most extreme working conditions. Carolina Men's CA9821 Hardware is second to none, with all heavy duty metal eyelets and reinforced Goodyear welt construction we are confident you will get the durability you expect from a Traditional Carolina Logging boot. These boots are on the top of are sales chart every year due to the quality of the product and the great price tag. These Carolina boots are great for all-around workers. This Carolina Logger in particular has constantly held up for the the most rugged Blue Collar customers year after year. 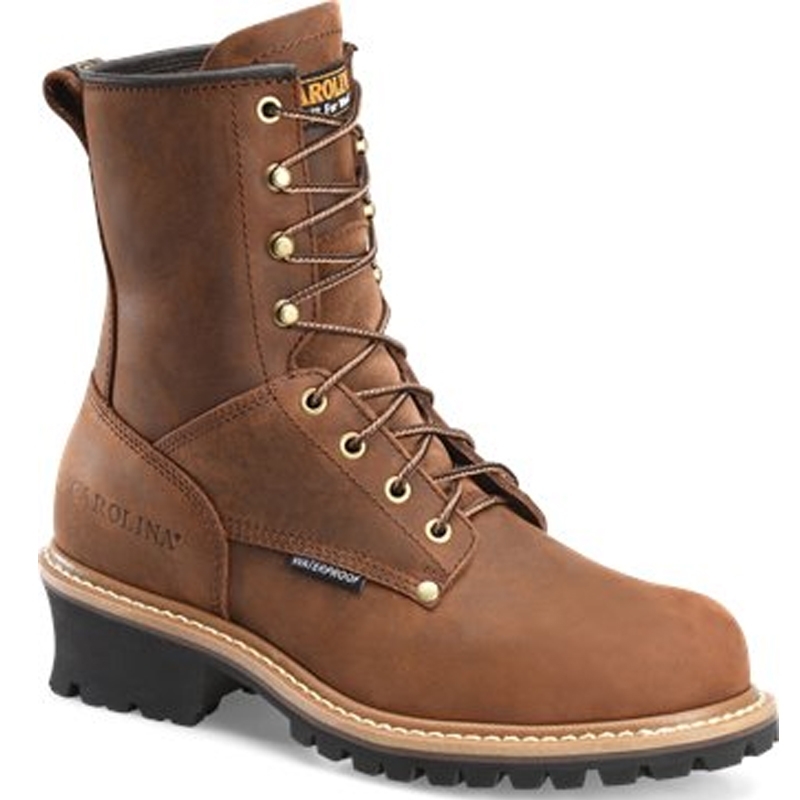 So if you are looking for a bang for the buck boot, look no further than the Carolina CA9821 Men's waterproof logger. Steel Toe - Footwear that meets or exceeds the ASTM Standards for compression and impact testing rating of I-75/C-75. Footwear tested by an independent lab that can withstand applications of 14,000 volts at 60hz for one minute without leakage.